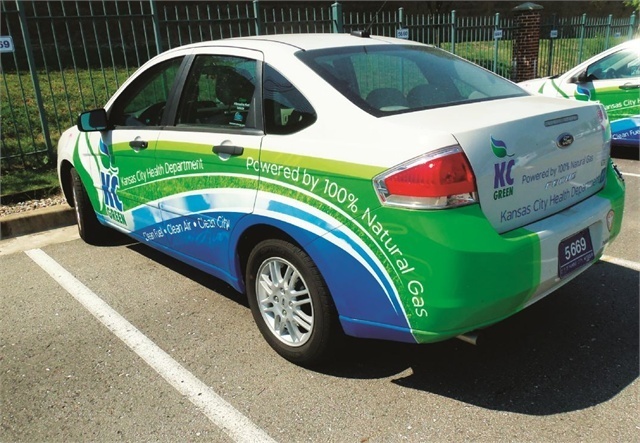 The City of Kansas City, Missouri’s Alternative Fuel Vehicle Program focuses on greening city fleets in order to improve regional air quality. The city currently operates 334 compressed natural gas (CNG) vehicles and uses an alternative fuel or an alternative fuel blend in most of the city’s roughly 3,000 vehicles. The city has a 15-year CNG history, beginning a CNG pilot program in 1997 with just 12 vehicles. Annually, the Alternative Fuel Vehicle Program results in the displacement of nearly half a million gallons of conventional gasoline and diesel, drastically reducing the dependence on fossil fuels. As a result, Kansas City has saved over $1 million by using alternative fuels. In addition to dramatic cost savings this program facilitates a reduction of air pollution. For example, shipping and transportation distances for the fuel products have drastically reduced because of more efficient service delivery methods and practices, contributing to a lower overall carbon footprint for the city. The program has also increased public awareness about the positive environmental impacts of clean fuels and serves as an example of the city’s commitment to improving air quality. While the greening of city fleets is an important sustainability initiative that Kansas City has taken on, it is most successful because it has been approached as one part of a much larger, holistic agenda to make Kansas City more sustainable. This program has also created local jobs. All of the CNG components and tanks used by Kansas City are made in the United States, and the conversions were done in Missouri and Texas. By identifying and capitalizing on local, state and federal resources, cities can develop similar programs and help grow local economies by creating green jobs. Heck Yeah! Summer 2012 Was Hot!